The Leupold VX-R Patrol 1.25-4x20mm Illuminated Riflescope gives you perfection in tactical use for Military and Law Enforcement fields. This Illuminated Weapon Scope built by Leupold has an extremely sleek design with daylight-capable illumination. The Leupold VX-R Patrol 1.25-4x20mm Illuminated Scope w/ FireDot Reticle is designed with proprietary motion sensor technology that turns the scope off after five minutes of non-use and then reactivates instantly when any kind of movement is detected. The Leupold VX-R Patrol 1.25-4x20 Tactical Scope has a readily available CR-2032 coin-cell battery that produces remarkable runtimes, while the fiber optic light pipe eliminates the need for an eyepiece-based control module. 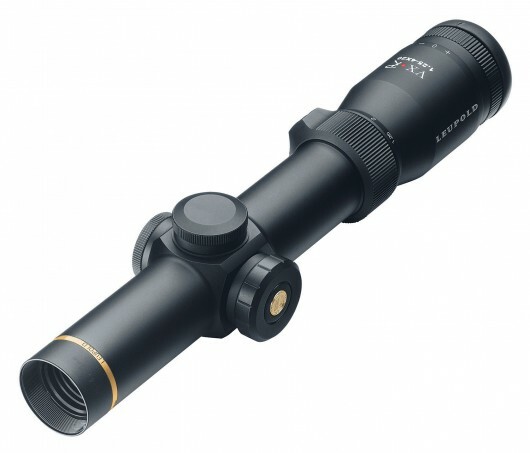 The 30mm main tube and finger-click adjustments on this Leupold Rifle Scope assure maximum adjustment precision, while the second generation waterproofing resists the effects of thermal shock much more efficiently than standard nitrogen. The Leupold Illuminated VXR Law Enforcement Weapon Scope houses the legendary Index Matched Lens System that, when combined with edge-blackened lead free lenses, offers astonishing clarity and light transmission, while the extreme fast-focus eyepiece ensures optimal diopter adjustment in the field. The Leupold VX-R Patrol 1.25-4x20mm Illuminated Military Riflescope comes with the patented 1-button design that minimizes bulk, while allowing users to select between 8 intensity settings, including a low/high indicator.